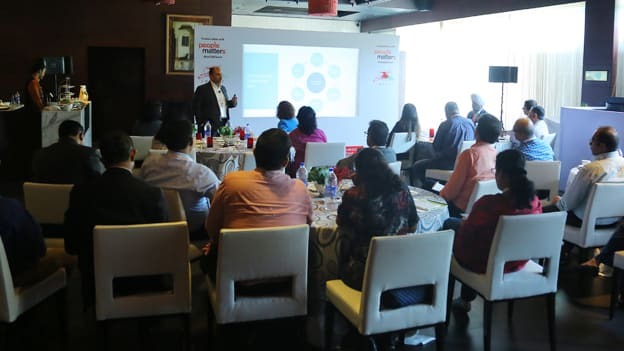 The Oracle Impact for Business Summit was held in New Delhi on September 28th, 2018. Leading Indian companies shared how innovative technologies like AI, IoT, Blockchain are being employed to address the challenges of HR, finance, and more. On the sidelines of this conclave, People Matters invited 18 top HR leaders to discuss how AI-based technology is changing work. Dipak Roy, CHRO of Bharti Infratel in a keynote session noted that AI adds a layer of self-awareness. He spoke about how machine learning uses its own intelligence for better outcomes as it starts with a fresh data-centric approach. This is good news. Because the scale and size of most companies are such that information is available. There is a need to explore and parse this data and learn to use the data and insights for improvement. The overriding 'ask' of the business is to have a digital strategy which is tightly knit with the HR strategy because the employee experience is directly related to this. Becoming a digital company requires an eye on how to leverage data. Talent acquisition, resource utilization, productivity, continuous measurement and driving employee engagement through daily experiences- these are some of the key action areas for HR. The need for logical, transparent and reliable data stacks to build a strong AI foundation was highlighted. But more importantly, apart from the technological and infrastructural elements, there’s a need to understand how organizations work is changing. As humans, we will not do information-processing or data-processing going ahead; machines will do it for us. Machines will move beyond old-fashioned automation-like sequencing and will solve complex problems for us. Therein lies a huge opportunity. Businesses and stakeholders must wake up to this reality, and start this journey, no matter where they stand today, by donning a high tech-focus. The ways of working are fast changing. There is an increasing need for competencies such as collaboration. Emotional analysis and sentimental analysis which have become necessary workplace tools, to address the needs of a highly distributed workforce. Optimization of manpower number and cost – fixed cost reduction/Manpower productivity enhancement (including outsourcing non-core and transnational function)/ HR Admin cost reduction. At the same time, making the process transparent, efficient and employee friendly. There’s a need to create a lean organization for down cycle, attract, reward and retain high-caliber and business critical talent/ IT-enabled HR processes for good governance/Build competence (Leadership and Functional). People conversation is missing. Employee communication mechanism is not so strong (and this includes mechanism of communicating Organizational and Functional objectives for annual goal setting. Lack of communication causes a poor line of sight and loosely defined KRAs). Performance coaching by managers is not practiced systematically or the process has substantially deteriorated. Leadership development – a robust process/system is missing. Also, communication and development plan is not aligned to succession. “How can I create an experience which is personalized to each person?” To enable managers, it is important to engage in the moment. A standalone engagement approach will not work, it has to be together while building a sense of data. Understand more about the employees and correlate parameters such as performance, attendance etc., to derive patterns for employees. HR leaders shared practical case studies in their organization’s context. A leading company had a situation where they were not sure whether hired candidates would join on the designated day of joining. So looking at onboarding and engaging right from the offer roll-out stage, collecting all the required documents beforehand, getting to know the person and thus predicting outcomes became important. They addressed the data challenges head-on to achieve this. Raising the digital skills up to mark was the biggest challenge on this onboarding effectiveness journey. Another HR Leader spoke about how using chatbots for HR queries – which eased the jobs of HR partners, created the opportunity for new jobs. Other pertinent HR agendas on the AI journey include addressing governance issues and integrating siloed functions i.e. bringing everyone together for one AI transformation journey. Perhaps, the most important agenda is on how HR should pace itself, to create new thinking and new capabilities which are AI-friendly such that man and machine can work together productively. There has to be a balancing of human touch and machine-intervention, and it will be a huge opportunity, fail fast, and eventually succeed in an age where man and machine are so intricately linked.